I typed f5’ should I have pushed the F5 key on the keyboard? have you copied and pasted the commands in your terminal? Reboot and try again. I have edited some links in my previous post. Sorry, I first tried copy & paste. When that failed I typed. I pressed enter after each command. After I rebooted, I typed inxi -Fxxz and here is what I got. I really do not wish to be a bother but I just downloaded this last week and I selected the “LTS” version. How do I update to 4.4.176? I selected ‘System’ then ‘Software Updates’ and it said my system is up to date. What iso did you used? Unless you’re really set on using the existing installation you might want to reinstall with an 18.0.2 image. 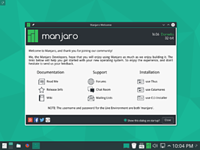 You might be able to transition to manjaro32 but you’re a very long way back from the current packages. Thank you jonathon and all who helped with this. You folks are terrific. I will try the new download to get up the the latest version.